Crafts Mid Wales is situated in the beautiful upland area of Montgomeryshire, Mid-Wales, and is operated by Beryl Smith, an accomplished and experienced artisan Basketmaker, Weaver and Living Willow Sculptor. 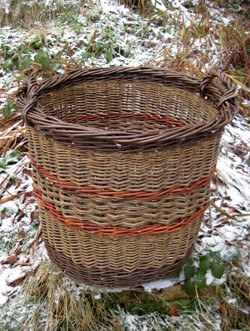 I hand weave lovely traditional and frame baskets, and also garden products, from willow and hedgerow materials, using traditional basketmaking techniques. I also make beautiful handwoven fabrics using a hand-operated floor loom. I create exquisite fine handwoven scarves from silk and wool using natural dyes, such as indigo, cochineal and onion skins, applying the ancient technique of Ikat (tie-dyed warp) to create the designs. 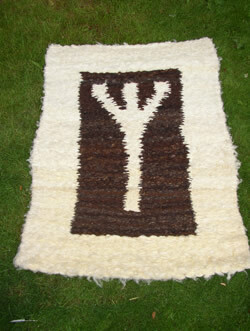 Another product I have developed is the Fleece Mat or Rug. This floor mat is made from raw sheep's fleece which is contained within a linen warp, using the Navajo technique of weaving. These mats are very thick and lovely to the touch, especially under your feet! And wonderful for lying on in front of the fire in mid-winter too!! They also make fantastic sleeping mattresses. Living Willow Sculpture is a winter occupation, usually done between the months of November and April when the willow is dormant. 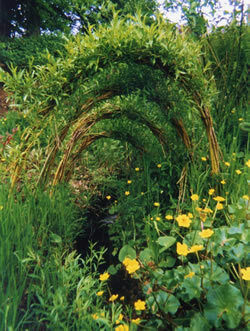 I have been creating Living Willow Structures since 2000 in schools, environmental centres and on community projects, private commissions, stately homes, the National Trust etc. facilitating, building and leading projects and courses. Please click here to read testimonials from some of my satisfied customers. I have products for sale in the online Shop, all of which are made by myself in Wales, and where possible from locally-sourced organic materials. Please visit the other sections of my site to see some of the work and projects I have worked on over the years, and my Products page to see the baskets, rugs and other woven products currently for sale.